As owners of E-type UK, father and son team Dominic and Marcus are living the dream. They’re doing what so many of us have considered over the years; giving up their office jobs to run a classic car company, indulging themselves in their lifelong passions. Dominic had owned an E-type for years, and had been successful enough in his IT career to have built up some capital. 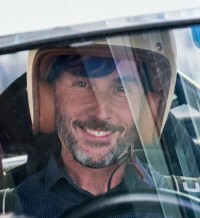 Son Marcus had a job in the City, in digital marketing, and in his spare time tinkered with Land Rover Defenders and raced an MGB in the MG Owners’ Club series. But buying a classic car company? That’s a big step. Is this the best E-type on the market? E-type UK had been established ten years earlier, but as a customer Dominic could see that it wasn’t running efficiently. When it became clear that the owner wanted to sell up, Dominic and Marcus moved in, with the aim of building the business back up, and moving into the highest-quality repairs, upgrades and restorations. Before anything else, though, the pair had to make sure the business they’d bought – which had ‘lost focus’, in the words of Dominic and Marcus – was running properly. First step: a bodyshop. The solution was to take on the building next door, and move the showroom and storage into that. Then a full bodyshop was built, with a state-of-the-art paintbooth and mixing area, a soundproofed metalworking area and a sealed filler room, to ensure that sanding dust is kept away from the rest of the workshop. A dedicated engine room has just been installed, along with an isolated ‘dirty room’ for stripping down and cleaning old mechanical parts. In the workshop, there’s now a stripdown bay, two restoration bays, servicing bays at the front, and others for longer-term mechanical repairs. Most importantly of all, there’s a new tea room, where the staff can sit during breaks. Ah yes, the staff… When Dominic and Marcus bought the company, the average age was 65, and only one staff member worked five days a week – the rest were part-time. Now the average is closer to 40, there are four new staff members (some with previous concours wins behind them) looking after the bodyshop. The company has also just taken on 21-year-old Jack, along with a workshop manager with 15 years of experience in E-type restorations. There was one last touch to improve the restoration experience for customers. That was to add an ‘interactive’ website to enable individual clients to view the progress of their restoration projects, with pictures uploaded at every stage, as well as the facility for the customers to ask questions online. It’s proved particularly useful for those overseas. Some of the most recent projects were on show at the time of our visit, including a couple of E-type Series 3s, which have become something of a speciality. The company has developed a range of upgrades for E-types, including the usual brake, suspension, five-speed gearbox and even air-con conversions – but the team have also been playing around with the S3’s V12. The first step to the engine upgrade is to convert to XJS fuel injection, using an aftermarket ECU to ensure the most appropriate mapping. The conversion ensures cleaner running and eliminates the classic Series 3 hot-starting problems. But now there’s a further step, with a new downdraught throttle body fuel-injection conversion under development, which will provide a big boost in power. One was going through the workshop when we visited. We head over to the showroom, and pull out a few of the best cars from this new DM Historics side of the business. There’s a race-prepared Lotus Elite, a superb Nash Healey – just right for the Mille Miglia – and a well built Autocraft Cobra, among several others. When the showroom is completed, it will also include a coffee shop, which brings us to part 3 of the masterplan. The company has already held one open day, and as hoped it attracted a wide range of classics, including an Aston Martin DB5, Bentley S2 Continental and Ferrari Dino. The next step is to hold more such events, and encourage informal weekend gatherings, making E-type UK/DM Historics the place to go for local (or not-so-local) car enthusiasts. Dominic and Marcus have certainly got the setting, on a picturesque Kent grain farm, close to Tonbridge. If you’re in the area, and in the market for a classic, or searching for a company to look after your E-type, book yourself a visit. And keep an eye on the E-Type UK website for news of events and open days.